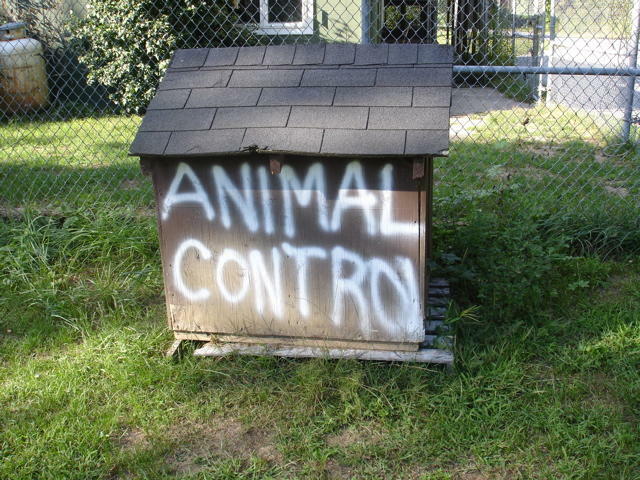 Yet another fine submission from our New England reporter, Spinning Girl, this dog house with ANIMAL CONTROl spray painted on its side was spotted outside a kennel in New Milford, CT. At first glance this appears to be a case of poor planning, the author having run out of space before completing his final uppercase L. But I think a more reasonable explanation is that the person who wrote this sign was bitten by a rabid animal--just one of the occupational hazards of animal control--and is now exhibiting the first signs of dementia brought on by the gradual shutdown of the central nervous system. Ending an all uppercase word with a lowercase L is a clear symptom of rabies. Citizens of New Milford, be on the lookout for a rabid animal control zombie carrying a spray paint can, probably attempting to eat your brains. William, You are seriously certifyable... and I love it! Looks Like they just ran out of space on the oLd dog house. CouLdnt fit the rest of the "l" on it.